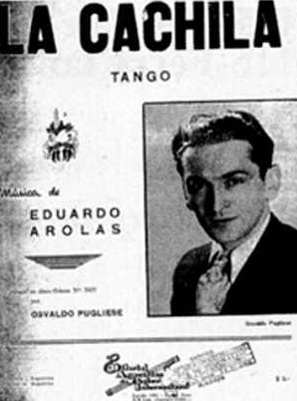 Arolas’ first well-known tango composition was Una Noche de Garufa, yet at this time, Arolas could not even read music, let alone write it down. So it was that Francisco Canaro helped Arolas to commit the score to paper. We might have heard too the story of the friendship between those two most prominent tango pioneers, Arolas and Roberto Firpo; a friendship that suddenly soured into a lifelong bitterness. Still, a lot about Eduardo Arolas and his life remains a mystery amid the nuance of legend, the misdirection along blind alleys of hearsay and the contradictions of various researchers. Arolas loved women but was he a womaniser and did he cast aside their adulation and a life of comparative luxury to pursue a single, true romance? Did that passion take him half way around the world from the Paris of the South to the Paris of the North? And there, did all hope die for Arolas, leaving him to drown his sorrows with alcohol and casual women and to die a pauper? Or, did he flee to Paris to avoid a messy love affair and perhaps to start a new life? We will probably never know the whole story, only its last page and here and there a few scribbled footnotes. One such footnote is of one of his most famous tangos, “La cachila”. Cachila, or cachirla is a local to Rio de Plata bird, with a strange habit of dragging a foot as if it is crippled. But the music of this rather dramatic tango is not really associated with a bird. One of the common legend tells that it was a nickname of one of many Arolas girlfriends. Could it be right? Perhaps or, then again, perhaps not. “El Choclo” was a nickname, “La Morocha” was a nickname, and many others, and all those tangos are always spelled with capital letters. Not so with “La cachila”. Then where does this name came from? Leon Benarós explains that once, when this tango, yet without a name, was performed by Arolas orquesta, his violinist Rafael Tuegols said to Arolas, watching the movement of a dancer: “Look at this creep! He dances like a cachila!” Arolas liked the comparison, and christened the tango “La cachila”. The problem with this explanation is that Benarós himself dates “La cachila” as of 1921, while Tueglos played with Arolas only between 1912 and 1919. Another explanation is that Arolas loved cars, owned one, and the make of the car was “La Cachila”, there is even a claim that it was something similar to Ford-T. Well, this might’ve been a good explanation; however, I was not able to find any reference to a car make called “Cachila”, yet, found more than one explanation that “Cachila” is an Uruguayan word for an antique and/or a crippled car. See it for yourself on Flikr. Obviously, “antique cars” did not exist in the 20s. A bit different explanation is given by Daniel Rezk, one of the organizers of Thursday’s “La Cachila” milonga in Club Gricel, Buenos Aires. He explains that “La cachila” was the name that Arolas gave to his car, not its make, and then he named a tango after the car’s name… however, it’s a bit strange to call your own car “a cripple”, is it not? “La cachila” enjoyed a lot of exemplary interpretations, but this tango was also directly responsible for creation of Troilo/Grela cuarteto. In 1953 Anibal Troilo and Roberto Grelo were invited for a theatrical play “El patio de la morocha”. In there, they had one number together – “La cachila”. On the opening night, their duo was so warmly received by the public that they had to play it again, and again… and then to record it… and so the new cuarteto was born.